The Pacific Crest Trail (PCT) is one of the two original trails designated under the National Trails Systems Act (NTSA) of 1968 which included the Appalachian Trail. The PCT, which runs 2,656 miles from the US-Mexico border to the US-Canada border, wasn't completed until 1993 as it's distinct trail the whole length. The PCT in Washington originally started as the Cascade Crest Trail (CCT) which was built in sections by different organizations and then incorporated into the 500 miles of the Washington length of the PCT with the designation as a national trail in the NTSA. The 500 miles of the PCT in Washington crosses the border with Oregon at the Bridge of the Gods over the Columbia River Gorge 40 miles east of Portland and proceeds north to White Pass on highway 12 across the southwest corner of the William O. Douglas Wilderness Area to the southeast corner of Mt. Rainier NP at the junction of the PCT and Laughingwater Creek trail from Three Lakes. From that junction, the PCT travels north for 11.6 miles to Chinook Pass where it crosses highway 410, thentravels north on the wilderness side of the boundary with the NP 3.5 miles to the boundary with the NP, wilderness area and the Crystral Mountain Resort, and then north along the divide with the resort and the wilderness area. That's the last the PCT is near Mt. Rainier NP. The PCT then traverses north along or near the Cascade Mountain divide through national forests, the North Cascades NP, wilderness areas and other lands to the Pasayten Wilderness area (Okanogan National Forest) to the Canadian border at Castle Creek to Manning Park, British Columia. The PCT along the eastern boundary of Mt. 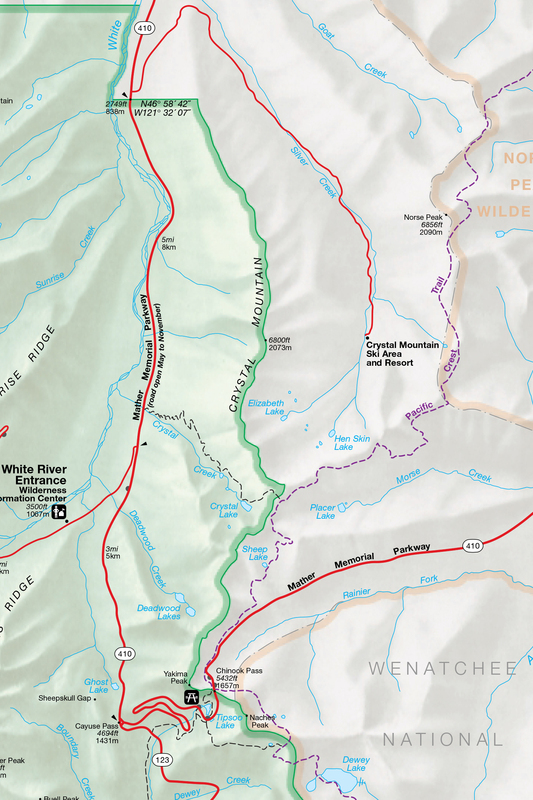 Rainier NP and the western boundary of the William O. Douglas Wilderness area, for the purpose of hiking, can be split into the southern and northern halves where the PCT cross highway 410 at Chinook Pass (the new entrance bridge). The PCT starts in the southern half at the junction of the PCT from White Pass (highway 12) and the Laughingwater Creek trail from the Silver Falls trailhead on highway 123 near the Stevens Canyon entrance. From there the PCT proceeds 10.4 miles north crossing between the NP and the wilderness area several times and passing by or near several lakes, arriving at the Naches Peak - Dewey Lake trail, a short, frequently hiked loop trail for visitors, and on to Chinook Pass. From Chinook Pass the PCT really doesn't travel in Mt. Rainier NP but east along the ridge along the American River across several passes, including Sourdough Gap which leads to the Crystal Lakes trail back into the NP, to the Cascade Mountain divide between Silver Creek on the west and Union and Crow Creeks on the east. On the PCT between the southeastern junction with Laughingwater Creek trail and Chinook Pass there are several side trails which connect to other trails east into the William O. Douglas Wilderness, the closest parts of which go near lakes and campsites. These include American Lake and Dewey Lake. Two Lakes is just a trail to a campsite. There are three access points to the PCT in Mt. Rainier NP. The most common is the area at and near Chinook Pass. From here the hiker can travel the PCT in either direction, the northern trail proceeds north along the eastern boundary in the wilderness to Sourdough Gap which connects to the Crystal Lakes trail and to the trailhead at highway 410 in the NP. The southern trail is the most frequently hiked trail, the Naches Peak - Dewey Lake loop trail, the eastern half of the loop being part of the PCT and the western half in the NP. From there the southern trail continues to the southeastern corner of the NP connecting to the Laughingwater Creek trail and continuing on the PCT through the wilderness area to White Pass. The Laughingwater Creek trail is another way to access the PCT, see Three Lakes trail day hike for more information, but it is a long day hike and often an overnight hike to the NP campground at Three Lakes and on to the junction with the PCT and either north to Chinook Pass or south to White Pass. 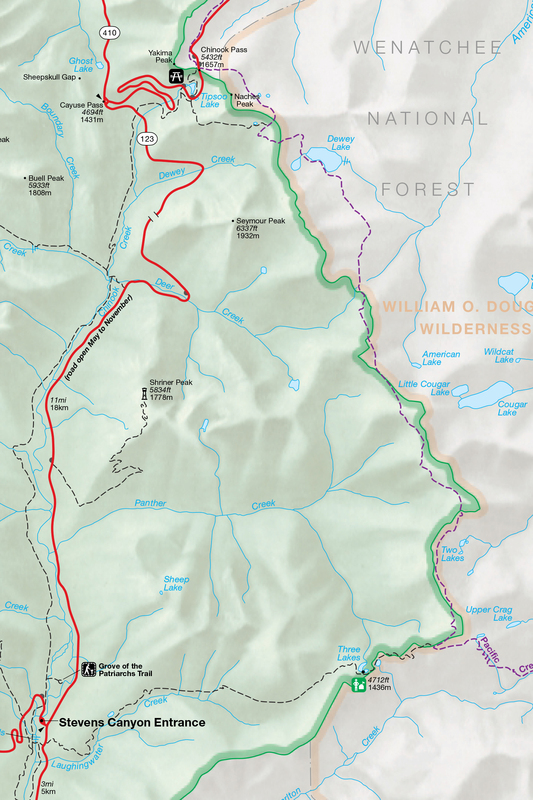 Some trail guides show the Laughingwater Creek trail can be a long 3-4 day, 29 mile hike in conjunction with the PCT to Chinook Pass and return to the trailhead down the eastside trail along the Ohanapecosh River. It can be done either direction but planning is necessary for campsites in the NP and a permit for the PCT. An access to the northern half of the PCT along Mt. Rainier NP is the Crystal Lakes trail with the trailhead off highway 410 just north of the White River NP entrance, see information about day hike for more information. This trail also is long for dayhikers to Crystal Lakes and onto Sourdough Gap to the PCT. There are two campgrounds at Crystal Lakes, which requires a NP backcountry permit. The PCT between Mt. Rainier NP and the William O. Douglas Wilderness Area is adminstered by the office of the Okanogan-Wenatche National Forest in the US Forest Service (USFS) and in operated and managed under their rules for the trail, hiking and camping on the PCT in either lands, but not on other land or trails in the NP. While hiking is pretty much the same on USFS and NPS trails, pets on leashes are allowed on the PCT and other USFS and wilderness area trails, but not on other trails in the NP. This means if you have a pet you can not take them into the NP on connecting trails or on the Naches Peak trail to Tipsoo Lake in the NP. You can camp outside the USFS campsites on USFS or wilderness lands, but you can not camp on NP lands along the PCT. There are no NP campsites on the PCT, only those at Three Lake in the southeastern corner of the NP on the Laughingwater Creek trail and those at Crystal Lakes on the trail in the NP to the PCT. On the PCT you can camp at the established campsites with a permit, see permit section below, following the rules for your campsite, which is at least 100 feet from any lake. It should be remembered the rules prohibit campfires along the PCT. You should also have a water filter or treatment system. The permits you will need depends on your trip, the distance you plan to hike, any camping you plan and campsites you plan to stay and where you access the PCT, meaning where you park your vehicle. There are interagency permits which work for both USFS and NPS lands available or individual agency permits. You can get more on the USFS permits for the Okanogan-Wenatchee National Forest at Chinook Pass and NPS permits for Mt. Rainier NP. You can also get more information from the PCT Association. It's safe to say you can't go wrong on the PCT for the variety and diversity of photography opportunities. There are numerous places for vistas and scenic views of Mt. Rainier along the PCT along with the numerous lakes, meadows and forests along the PCT. The southern trail, especially the Naches Peak - Dewey Lake trail (NP) either as a loop trail or on to the PCT to the lakes on the PCT to the junction with Laughingwater Creek trail has views of Mt. Rainier most of its length along with scenes of forests, meadows and lakes. The northern trail is good for views to east of Mt. Rainier as it traverses along the Rainier Fork of the American River before climbing to Sourdough Gap where there is a view of Mt. Rainier before the PCT turns north away from the NP. As for photography gear, it depends on your preferences and trip, but it's the old adage, "You take the picture with the camera you have. ", and the philosophy, take lots of photographs and leave no trace. As mentioned about pets, you can only have them on your hike on the PCT itself and always on a leash. Otherwise, please let them at home for their sake and other hikers and campers. The USFS and NPS have differing rules on guns, but both allow you to openly carry a gun or concealed with a permit. The difference is the use of a gun. The USFS explains the rules for firearms, while the NPS has standard rules that prohibit the withdrawal, use or discharge of any firearm regardless of where or the conditions. The PCT along the eastern boundary of Mt. Rainier NP is short but a great hike for a day from Chinook Pass or longer to or from either the Crystal Lakes or Three Lakes trails. It's hard to go wrong with photography opportunities as the northern and southern trails have different views of Mt. Rainier and other scenes. ** - A note on the southern trail map. The trail indicating the junction of the PCT with the laughingwater Creek trail is incorrect. The PCT goes to the east of Crag Lake and up the slope above the lake to connect to the NP trail right at the most southeastern part of the NP boundary. Below are some resources for more information on the PCT and the trail along Mt. Rainier NP.